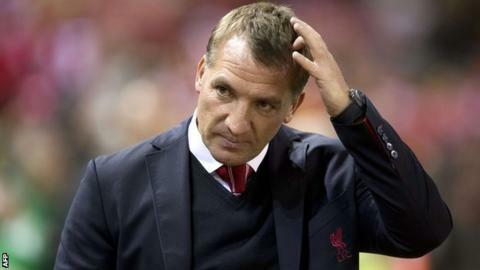 "Brendan Rodgers's biggest failure is that he's not invested in his staff," Meulensteen told BBC Radio 5 live. "He has got there because of his philosophy and I rate him for that," he added. "He has obviously got people around him who he obviously thinks are the right ones. "But I think he could have done with someone who has been there, seen it and done it. "Playing in the Premier League and the Champions League, it's a different rhythm that requires a different style of training and a different management strategy through the week. You need to know these things." Former striker Robbie Fowler, who scored 171 goals in 330 games for Liverpool, told BBC Radio 5 live: "In Brendan's eyes he has the right people at the club. "Brendan is comfortable with his staff. He has Mike Marsh, who was brought up at Liverpool and knows everything about the club. "And he has Colin Pascoe, who he has worked with for years. He's comfortable with them." Meanwhile, Fowler wants midfielder Steven Gerrard to see out his playing career at Anfield. Skipper Gerrard, 34, said he could join another club next summer if Liverpool do not offer him a new contract. "Speaking from a selfish point of view, I love Steven Gerrard and I'd love him to stay at Liverpool," said Fowler. "It's like Ryan Giggs at Manchester United - players come into the club and are instantly lifted by seeing Gerrard. "He might not be as good as he used to be but he's still a class act. "The common consensus is that he will go abroad if he did leave Anfield, but if he did become available I think clubs in the Premier League would want him. He's still that good a player."